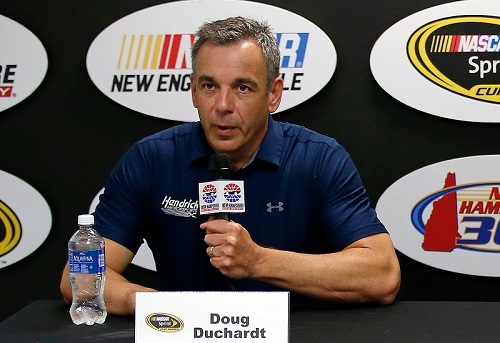 General Manager Doug Duchardt will leave Hendrick Motorsports at the end of June, according to an announcement from the Monster Energy NASCAR Cup Series race team Tuesday. He will not be replaced. Instead, his duties will be spread to people in other positions within the organization. Duchardt has been with Hendrick Motorsports since early 2005, first joining the company as Vice President of Development. He became the race team’s first General Manager in mid-2013. In Duchardt’s 12 years at HMS, Hendrick teams have won seven Cup Series championships, all with the No. 48 team and driver Jimmie Johnson. Also, Stewart-Haas Racing, with a strong technical alliance with Hendrick until the 2017 season, added another two championships with the No. 14 team and Tony Stewart and the No. 4 team and Kevin Harvick. Hendrick Motorsports built the engines and chassis for the two SHR titles. Hendrick Motorsports field four cars at the Cup level — the No. 5 of Kasey Kahne, the No.. 24 of Chase Elliott, the No 48 of Jimmie Johnson and the No. 88 of Dale Earnhardt Jr.